NOTE: to make things easier, make the cheesecake and crust on one day and the mousse and ganache on the next day. Cheesecake lasts longer than mousse. Keep this cake refrigerated and will last up to 2-3 days but is best eaten the day it's made. Crush cookies in a food processor or in a ziploc bag with a rolling pin or mallet. In a bowl or food processor, pour melted butter on top of the crushed cookies and add the espresso powder (optional), and mix or pulse well. Place the oreo mixture at the bottom of a springform pan. Smooth out the mixture with the bottom of a measuring cup or glass. Wrap the bottom of the pan in a double layer of aluminum foil. Place the crust in the freezer while you make the cheesecake. Put a kettle or pot of water on to boil. Preheat the oven to 325 degrees Fahrenheit. Working in a stand mixer (or large bowl with hand mixer), preferably fitted with a paddle attachment, beat the cream cheese at medium speed until it is soft for about 4 minutes. With the mixer running, add the sugar and salt, and continue to beat another 4 minutes or so, until the cream cheese is light. Beat in the vanilla extract. Add the eggs one by one, beating for a full minute after each addition to yield a well-aerated batter. Reduce the mixer speed to low, and stir in the heavy cream or sour cream. Bake the cheesecake for 1 hour and 15-30 minutes, at which point the top will be lightly browned and may have risen just a little above the rim of the pan. Turn off the oven's heat, and prop the oven door open with a wooden spoon. Allow the cheesecake to luxuriate in its water bath for another hour. After 1 hour, carefully pull the roast pan/springform pan setup out of the oven, lift the springform pan out of the roaster—be careful, there WILL be some hot water in the aluminum foil—remove the foil. Let the cheesecake come to room temperature on a cooling rack. When the cake is cool, cover the top lightly and chill the cake for at least 4 hours or overnight. Make the mousse once the cheesecake has cooled. Place the chocolate and butter in a heatproof bowl, and place over a saucepan containing barely simmering water (or use a double boiler). Melt the chocolate and butter together and stir with a whisk until smooth. Add in the espresso powder. Remove from heat and cool slightly. Add the egg yolks to the chocolate, 1 by 1, beating with a whisk until incorporated. Set aside. In another bowl, beat the egg whites until foamy. Add the cream of tartar, and continue to beat. Gradually whisk in 1/4 cup sugar, and continue beating until stiff peaks form. Beat heavy cream in a chilled bowl with chilled beaters until it begins to foam and thicken up. Add the remaining 2 tablespoons sugar and vanilla. Continue to whip the cream until it holds soft peaks. Gradually and gently fold the egg whites into the chocolate mixture to lighten it. Then, delicately fold in the whipped cream. Take care not over work the mousse but make sure you blend in the cream well. Place the mousse on top of the cooled cheesecake while still in the springform pan. Cover the mousse cheesecake with foil, being careful to not let it touch the mousse. (If your springform is too small for this, just use less mousse in the cheesecake and instead eat them in ramekins while you prepare the ganache!) If making the ganache immediately, place mousse-covered cheesecake in the freezer as you make the ganache (the cheesecake should NOT be in the freezer for more than 30 minutes). 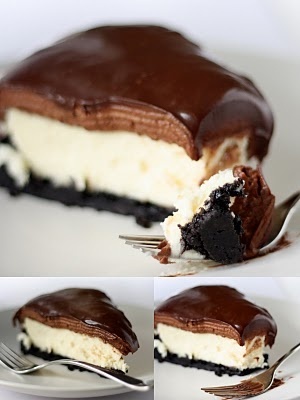 If making the ganache later, place the cheesecake in the refrigerator for a few hours. Either way, the ganache must be cool before you can pour it on top of the cheesecake. Heat the cream in a small sauce pan over medium heat. Heat it up just BEFORE it boils. Place the chocolate in the cream, and remove from heat. Stir the mixture until smooth. Stir in the espresso powder and rum or vanilla extract. Allow the ganache to cool for about 15 minutes before pouring the mixture on top of the mousse cheesecake. Release the springform pan. With an offset spatula, smooth the ganache while starting at the center of the cake and working outward. (I did a "crumb" crust by placing a thin layer of the warm, not hot, ganache on top, allowed it to cool in the freezer for 30 minutes, then I poured more on the cheesecake after releasing the springfrom pan so that it could pour down the cake.) Don't do exactly what I did, though. Just pour ganache on top once it has cooled. Keep in mind that the cold temperature of the cake will cause the ganache to firm up quickly, and you may have to pour more on top. Save the rest of the ganache for decorations (if you whip the ganache when it's cold, you can pipe a beautiful decoration) or save it for something else.